OK, Bobby Flay. You've already taken down one of D.C.'s finest (see Battle Frozen Peas), even though Morou was clearly robbed. So here's hoping your next "Iron Chef America" match-up with a Washington chef ends differently. 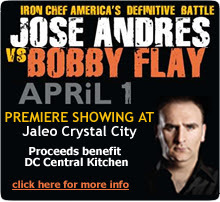 The Spanish "boy wonder of culinary Washington," José Andrés, will battle the "Boy Meets Grill" Iron Chef on April 1, and Andrés is throwing a big ol' screening party/fundraiser at the Crystal City Jaleo, starting at 8 p.m. Admission is free with donations and proceeds from the evening going to DC Central Kitchen. Guests can sample Jaleo's paella and Spanish ham and order off the regular tapas menu. The show will air at 9 p.m. on big-screen televisions. Joining Andrés in Kitchen Stadium will be Café Atlantico chef Katsuya Fukushima and Ruben Garcia. Call Jaleo Crystal City at 703.413.8181 to reserve space and cheer on Andrés. And watch out, Flay. From the looks of that expression, José means business. With Katsuya Fukushima at his side, Jose Andres may have the best sous chef in the history of Iron Chef America. I predict that Jose and Katsuya's innovations will kick the hot sauce out of Flay's southwestern behind! Go, Jose! Let's hope Alton Brown can pronounce José's name correctly and not repeat the embarrassment of "Roberto DonAHH".